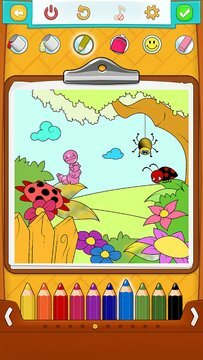 Spring Coloring Pages is a coloring book for kids with a beautiful collection of flower coloring pages, butterfly coloring pages and more nature coloring pages for kids. Isn't it beautiful when kids use vivid, bright colors to color in a spring coloring page? All the creativity, imagination and sense of happiness and fulfillment are expressed on one coloring sheet for kids. Coloring books for children such as Spring Coloring Pages help your kids' creativity and art skills blossom like a flower. Don't wait, tap the “Install” button and see for yourself. When coloring in a coloring book for kids, children often take it as a commitment or as homework. However, coloring games on the screen of your mobile device are a totally different story. Coloring games for kids are exactly that – games... and kids love playing them. So, Spring Coloring Pages is actually a Spring Coloring Book converted into a coloring game for kids with plenty flower coloring pages, butterfly coloring pages and beautiful nature coloring pages for children. 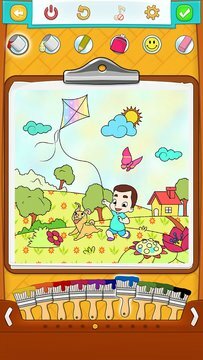 Tons of fun and creativity development in one coloring app for kids. Ernest Hemingway said that “when spring came, even the false spring, there were no problems except where to be happiest.” If you're driving, doing office hours, cooking, doing everyday chores or just need some time to relax, your child should have something fun and useful to do. Download Spring Coloring Pages and fill your home with beautiful colors today! All the drawings and images in the app are copyright of Peaksel.